We have talked a lot in recent months about multi-CAD, looking at the benefits and possibilities that it offers. Now with the latest release of PTC Creo, companies are now able to take advantage of multi-CAD. How does Creo 3.0 make multi-CAD a possibility? There is the ability in Creo 3.0 to import all of the major CAD formats available in the market. This feature is built right into the platform. The capability to open some of the key CAD formats right into the platform, including Catia and SolidWorks. The capability to save as/ export out a copy of what you are working on into one of these other formats as well. But how do these features translate as advantages for business? Let’s now take a deeper dive into the technology and find out why it is useful for organisations. It means your IT department doesn’t have to manage multiple CAD technology platforms. It means that engineering has full flexibility when it comes to using the resource available, as your teams are no longer siloed depending on the CAD system they use. It means as an organisation that you will be able to save time and money, by streamlining your product development. On-Demand conversion – choosing as and when converting is the most appropriate course of action. This approach is usually more efficient as you are only converting data as and when it is needed. 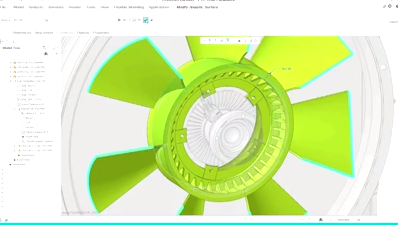 Use the Unite Technlogy to open objects in Creo 3.0 as they exist, without converting them upfront. This approach is means if you need to make a change to one object in an assembly, you don’t need to convert the assembly before you can make the change. Using the Open feature, all of the necessary data is brought into Creo, so the design engineer has the context that they need to make changes or amends. But the business hasn’t yet had to bear the burden of any additional business objects. Now you can go and make changes to the object you need to amend and Creo will automatically prompt you to convert the data to a Creo model. Yet, effective collaboration means you can work as efficiently with partners from around the world as with an engineer based in your office. It also means time and money is saved because you are not having to continuously remake CAD models to make straightforward edits. With the Unite Technology platform, the traditional hurdle of working with CAD data from other systems is no longer a challenge. Just as with your CAD consolidation, you can bring in elements from other CAD systems right into Creo. Using the Update feature of Unite Technology, it means there is nothing new for your engineers to learn. They can use Creo in the way that they always have, while working on the CAD data that originated in a different CAD system. You can also save out a multi-CAD model into a single CAD format.